Whao! UPND is scoring goals! I am celebration in the manner Fred Mmembe’s Post newspaper headline celebrated when his friend Mutembo Nchito was confirmed as DPP. It seems this February was really the best performance for UPND ever since Hakainde Hichilema took over in 2006.
Who will repeat the nonsense that UPND is a tribal party after its penetration in Mpongwe with Hakainde mingling so easily and emotionally local people? Our Bemba and Lamba speaking brothers and sisters are beginning to like him emotionally. It does not really matter the actual parliamentary results. UPND has benefitted. Once the traditionally UPND voters of Southern, Western and Northwestern provinces see that the other provinces will vote for HH in 2016, they will vote for HH in larger numbers than before. How do I know this? Well, remember that after Chiluba’s 1991 victory all presidents won by a minority vote of less than 50%. Since majorities have been anti-government many Zambians have mainly voted for a party that seemed likely to remove the incumbent. Sata benefitted from this situation. 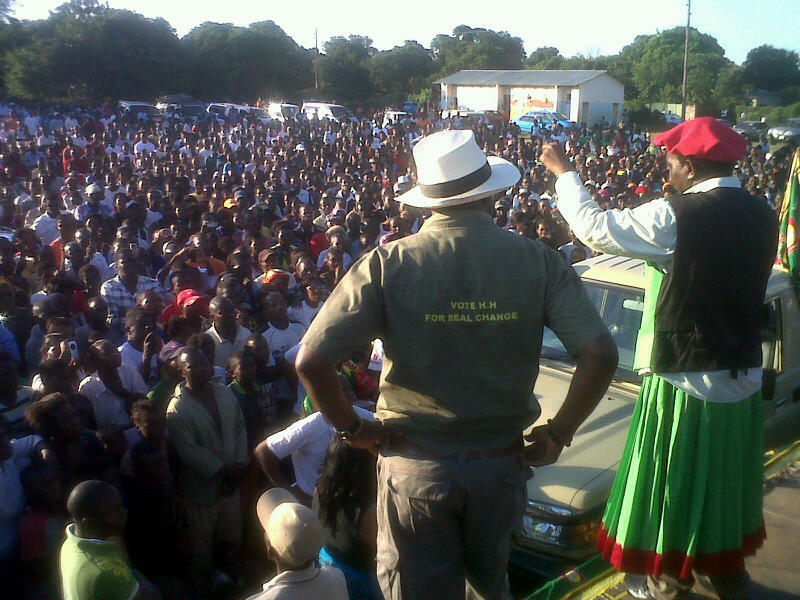 The more HH convinces his traditional bases that next time around other regions will vote for him. The more he gets more defections towards him. So far so good! Ignore some of those so-called analysts on MUVI TV. The opposition parties were absolutely right to seek SADC hearing over Sata’s human rights record. If Commonwealth are foreigners, why can’t Zambia quit her Commonwealth membership? Sata used to go even further to Taiwan which is not part of Zambia’s regional body to seek financial assistance! And can Bupe Chanda really be the best whom PF can allow to be defending them on MUVI TV? Don’t they have better manpower? No wonder PF have no clue on anything. They are merely reacting to stimulus on everything. In October 1996, Post Newspaper’s Fred Mmembe severely attacked Chiluba’s human rights record in Cape Town when he received the Commonwealth Press Union’s (CPU) Astor Award for Press Freedom. This was in the presence were real nuke nkume like then SA deputy President Thabo Mbeki, Labor Party opposition leader Tony Blair, ex SA President Frederick de Klerk and Commonwealth S.G Emeka Enyaoku. Was that wrong? (By the way, then should CPU must grab back Fred’s Award now that he is a threat to democracy?) Earlier in June 1996, SADC heads of State like Mandela, Sam Najoma, Robert Mugabe and Ketumile Masire discussed Zambia’s political crisis. Roger Chongwe, since you also complained to SADC as an opposition leader of LP, why can’t you do the same against Sata now? Just forget about him. He has already discarded in his dustbin you after sending and then embarrassing you over that useless Commission in Western Province. Get out of Sata’s dustbin and join UPND. They will wash you the way they washed Moonde. On 3 June 1996, Fred Mmembe’s Post newspaper editorial even called for an aid freeze to Zambia, and later hailed it when British Minister of Overseas Development Lydia Chalker withheld a $10 aid that was allocated to Zambia. From 7 August to 5 Sept 1996, the Commonwealth Human Rights Initiative (CHRI) visited Zambia on a ‘fact finding mission’ and on 30th September they published in The Post a full-page findings paper criticizing Chiluba’s Government. It was signed by Kamal Hossain, Anita Raynell Andrerenuk and Neville Linton. So again during this HH month has shown them that he can have international friends, not Sata who has not a single head of State as a friend in the entire world. Even Mugabe the only one who visited him, could only meet him on the border of Livingstone and perhaps they are too embarrassed to disclose what they discussed! If you believed that lie insinuated by the pro-PF newspapers namely, The Post, Times of Zambia and Zambia Daily Mail newspapers that Rupiah Banda’s lawyer Robert Amsterdam insulted you, then you are the useful idiot. Oh yes! Come and jump on my back if you think I have insulted you. You are useful to those who want you to join in their hatred against Amsterdam, and you are an idiot because you follow blindly newspaper interpretations without understanding the logical meanings of the statements on you own (check dictionary definition of an idiot). Robert Amsterdam’s statement was that two men (guess who), have launched a campaign against Rupiah Banda to satisfy their selfish and they are intending or trying by media publicity to recruit you so that you follow them blindly. He meant that their intention is to make you useful idiots. So what is the fuss, to the extent of some characters are calling him a racist? If Amsterdam is a racist why would he defend Rupiah Banda a black man? If I say that the intention of Cosmo Mumba is to make you his cadres, does this mean I am saying you are Cosmo Mumba’s cadres? You mean your mind has no natural logical connectivity? It can not interpret statements? When you read a newspaper look for a direct quotation of the speaker, not the headline. Headlines are formed by editors, who are often mediocre or greedy charlatans trying to mislead readers. Read the quotations on what Amsterdam actually said from the Zambia Daily Mail, The Post or Times of Zambia and see for yourself and examine what he actually said. So yes! Because you do not read things clearly newspaper editors have fooled you into interpreting Amsterdam’s statements wrongly. You have followed their interpretation blindly and they have used you to hate Amsterdam. So you qualify as a useful idiot. I hope it’s only on this incidence and next time you will be careful. So again HH got this one right. He has refused to be used as a useful idiot by HIPCs (Highly Indebted Poor Comrades) who want to force us to cancel their debts instead of requesting us for a debt relief like our able former finance minister Ngandu Magande did with Zambia’s creditors. Justice Minister Wynter Kabimba’s statement in The Post that it was unconstitutional for UPND to expel Sata’s mai nini (junior wife) number three at agriculture ministry Moonde is the worst show of legal ignorance I have ever heard from a lawyer. According To Kabimba, since the constitution allows President Sata to appoint any MP, then those opposing the appointments are breaking the constitution. His interpretation is shallow, very shallow indeed! The constitution allows Kabimba to marry any woman of his choice (freedom of association). So according to him, this implies that he can approach any married woman and if the husband to the woman complains he says, ‘the constitution allows me to marry any woman! Since your wife agreed to marry me, I am marrying her as maini number three with immediate effect’? Please, is it allowed that those with information tell us what grade Wynter Kabimba got in jurisprudence during his UNZA student days? Did he not get a ‘silent’ in jurisprudence? When the constitution allows the President to appoint anybody from Parliament there are two conditions to be fulfilled. Firstly, the appointed person must consent. MPs, including PF MPs are free to refuse his appointments. That is why the law allows them to resign. Why did Wynter Kabimba not tell Baldwin Nkumbula and Akashambatwa Mbikusita Lewanika not to resign from Chiluba’s government in 1992 because the constitution allowed President Chiluba to appoint from among them? Secondly, the person being appointed must not accept the appointment by breaching any contract which he has other people; otherwise those people have a right to take action against him. UPND members agreed not to accept these appointments and Moonde is breaching that agreement. As a club, UPND has a right to form its own rules for eligibility. If you don’t agree with it, do not stand as MP. Even Jehovah’s Witnesses don’t allow their members to join the armed forces. If a member joins and they excommunicate him. Can Kabimba argue that Jehovah’s Witnesses are breaking the law because Zambia Army is legally allowed to recruit any Zambian? PF itself never had a single MP serving in the MMD governments and it helped them. Was Sata breaking the constitution? When you come to think of it. It seems PF’s strategy of creating too many bye-elections has backfired against them while it seems good UPND. Bye-elections are exciting constituents into an election mood while making UPND always on the move. It would surely have been difficult and boring for constituents if UPND organized those rallies where there are no bye-elections! Anyway, PF have run out of ideas because UPND is no longer like Arsenal. They have become like Bayern Munich which plays an attacking game without conceding silly goals. If those other UPND MPs want to join PF as Guy Scott claims, let them join so that they too fall and UPND remains intact with principled members.